It's not to late to join the group that will be representing the U.S. at the World Cup in Pipe Smoking to be held in Eindhoven in the Netherlands the weekend of October 14-16. 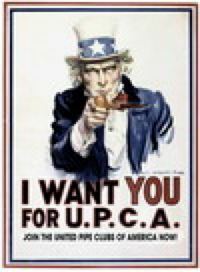 All members of UPCA member clubs are eligible and welcome! We expect to send a strong delegation but the more the merrier. This promises to be another outstanding international pipe smoking event with participants from many countries. In addition to the World Cup smoking competition, there will be a pipe show, dinners, programs and the possiblity of sightseeing. Come along to meet new friends and see new places. Information is available at www.worldcuppipesmoking.nl <http://www.worldcuppipesmoking.nl> . If you have questions, please contact Vernon Vig at vevig@aol.com or Doc Garr at michael.garr@wilkes.edu.